Happy New Year to everyone! I took a much-needed break to spend time with my family and am ready to kick off the brand new year by continuing to tell you about the amazing time we had in Orlando last month. There is so much to do in Orlando, as you would guess, but not everything has to do with the theme parks! 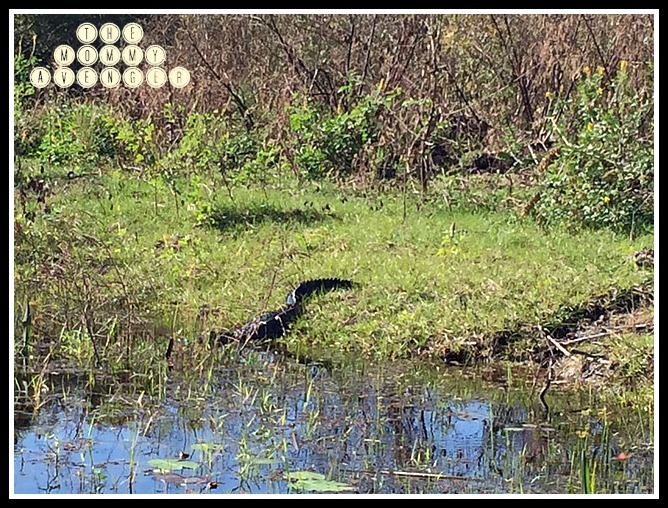 One of our very favorite excursions that we took on our trip was to a place called Boggy Creek Airboat Rides. We wanted to get an idea of the wild life in Florida that is so unlike where we live in the Northeast. What better way to experience that than take a boat ride to see alligators in their natural habitat? We were so excited to be invited* to do! 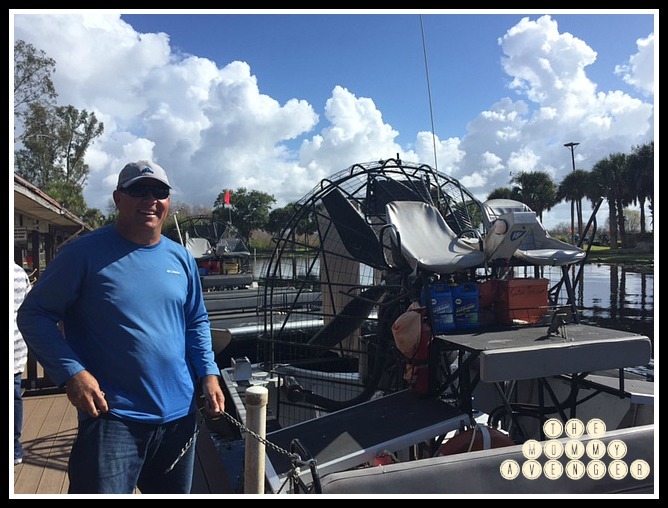 We took a short drive to Boggy Creek, where the airboats are docked, just a little ways away from Orlando. We arrived to a very unassuming, secluded spot, the perfect kind of location to spot wildlife. The staff at Boggy Creek was super nice and right away we were welcomed on the boat to prepare for our ride. Chris, our captain, was super nice, laid back, and informative. We boarded with a couple of other families and we were on our way through a swampy lake with overgrown grass. I was surprised that we were able to go through areas that had so much vegetation, but it was so cool to do so because we were headed to a place where we would never be able to explore on our own. The boat ride itself was really fun and just that would have been a great way to spend time together as a family. However, we quickly began to spot wildlife and that made the experience really great. Soft shelled turtles, hard shelled turtles of all sizes, and then we started spotting alligators! We found a nursery where the mother alligator keeps her babies and where they sleep and eat. We actually spotted the mom and that was incredible to see. Moving on in our ride, we spotted a young alligator watching us from the banks. We were so close we could almost reach out and touch him! He went into the water and crossed in front of us. We continued on and stopped to talk about some of the area we were seeing and then we noticed, completely camouflaged in the water next to us was a very large alligator enjoying a sunny Saturday morning. It was really incredible to see. One thing I loved about going to Boggy Creek is that there is an absolute respect for nature and these living creatures. It isn’t a tourist spot to come and gawk at the animals and to keep them caged up, living in captivity. Instead, it was a glimpse into their world, where they remained undisturbed and happy. After our hour long boat ride was over, we were able exit the airboat to see a small alligator and learn more about this animal up close and personal. As there were only a few of us there at a time, this allowed a quiet and respectful interaction with the animal. My kids were able to hold Fluffy, a three year old alligator, and feel what his skin and body felt like, learn what makes him tick. I got to hold him, as well, and it was so much different than I would have guessed. But, again, this wasn’t a tourist attraction where the animals were being exploited and sat on to take a picture. It was being able to enjoy nature in a respectful way. I really appreciate that part of the money made at Boggy Creek is in turn used for conservation of these animals and their habitat. Our family thoroughly enjoyed our visit at Boggy Creek and would highly recommend making a visit with your own family if you find yourself in Florida. It was definitely a highlight of our vacation and one we are so happy we got to enjoy. 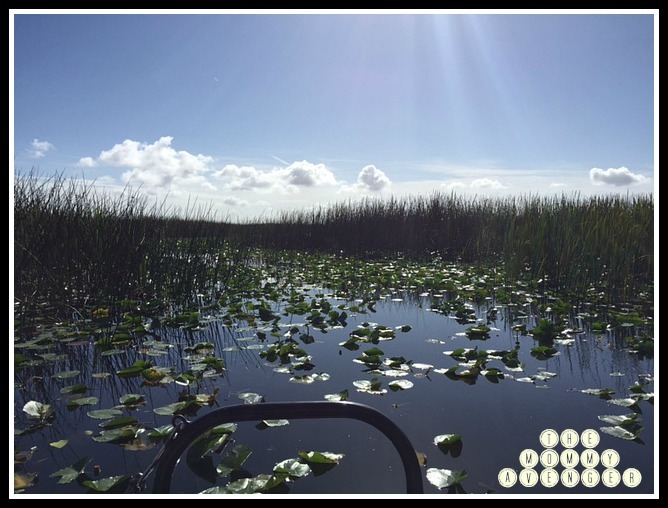 You can learn more about Boggy Creek Airboat Rides on their website and schedule your own visit while you are there! Looks amazing! Something to keep in mind if we go to Florida!